A hard wearing machine with all the extras you'd expect from a top of the range model. A Energy Rating, and very quiet too - it will fit into any house with no problems. AEG's technology advances help improve drying time, and save you money on energy! The AEG Lavamat washer function boasts OptiSense technology meaning it weighs the amount of washing in the machine, and only uses just the right amount of water necessary saving you money. It has a hard wearing invertor motor and it is brushless, so noise is reduced. The machine runs at 77 decibels on spin and 49db on wash. The AEG Lavamat has 2 wash programmes and 3 drying programmes. The dryer features sensor drying so that the moisture is measured until the clothes are dry and the machine will stop automatically. The control panel is a simple dial button with LED display and is very easy to use. It has a large porthole and wide opening door so it is easy to load when carrying an arm full of laundry. The washing programmes include anti crease programme, cotton programme, easy iron, intensive, sports cycle as well as woollen or silk programmes. This machine has been awarded the gold woolmark for care for your delicates. Whats more this washer dryer is suitable for allergy sufferers with the allergy plus programme. The AEG Lavamat has a steam fuction so you can refresh your clothes, perhaps you have spent the day with a smoker and need to freshen up your clothes or just need a blouse or shirt freshening up for work. The AEG lavamat has a 24hr delay timer, a countdown to the end of programme and an end of programme whistle. Click here to read 21 buyer reviews at ao.com. At the time of writing 100% of them would recommend this model to a friend which is a pretty big thumbs up we think you’ll agree! The dimensions for your kitchen are 84.2 x 60.0 x 59.0cm. The AEG Lavamat has an A energy efficiency rating and would cost approximately £147 a year on wash/dry function; and £37.50 on wash/spin function. 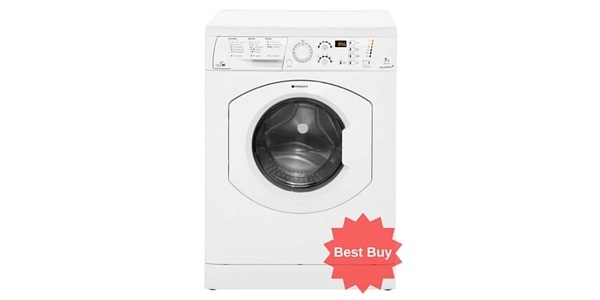 It has an A rating for both wash and spin performance. This machine has a 7kg drum so is great for the average family size. The AEG Lavamat has a superfast spin speed too, spinning at 1600rpm so that your clothes will take no time to dry. The control panel, the extremely hard wearing invertor motor, the solid door all help to insure that this machine is built to last. In addition it comes with a 2 year manufacturers guarantee. A washer/dryer with all the frills? Look no further. Some may find all the different settings hard to use at first.